I withheld my opinion on the new Maseno School German Machine until I got a chance to ride in it. This is the Mercedes Benz Travego 1, a limited edition series of luxury buses that's only inferior to the one used by the German National Football Team, Die Mannshaft. Ordered in January 2016, from the Daimler Assembly plant in Bremen, it took 14 months to put together and an additional 8 months to be shipped to the port of Mombasa. It just arrived in the lakeside city of Kisumu last Monday, and was displayed to the public for the first time the following day. The Maseno School new German Whale is a beast of a machine. With a 10,000 kilowatt power generator installed under its belly, this bus acts as a mobile power plant, which can power an upwards of 300 residential homes and can light up the entire Maseno town on its own. Its body is made up of a thin strip of photovoltaic modules that utilises the equatorial heat to recharge the solar generator under its belly, making sure there is no blackout in Maseno School, Maseno University, Maseno Mission Hospital, Maseno Rocket Launching Pad, Maseno Regional Blood Bank, Maseno Institute for Nuclear Science & Aerospace Technology, Maseno Primate Research Institute, Maseno Equator Bottling Plant, Maseno Forest Research Institute, Emabungo Marijuana Juice Extraction Plant, and the Ebusakami Technical Institute of Mukobero Research. The assembly plant in Bremen couldn't have come with a more sophisticated interior. With a wireless panoramic video wall, the Maseno School new German Machine is more sophisticated than the concert hall at the Grand Kremlin Palace. Every seat is fitted with what looks like an improvised gearbox which comes with a polaroid 3D glass, so every passenger can select their favorite movie from the in-flight entertainment package and use their 3D glass to view it on that panoramic video wall. Even the Real Madrid team bus don't come with this package. 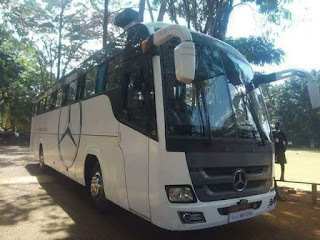 For those travelling to the Regional Ball Games with this beast, the Maseno School German Machine is fitted with an anti-hooliganism cordon that includes an armored exterior that can withstand a rocket propelled grenade, the windows also fitted with an extra layer of special fibre glass that automatically wipes itself. And if you find yourself in a blitz of stones from expert slingers in Kit Mikayi, every seat is also fitted with an overhead safety compartment that comprises of a sky-diver's parachute, a portable oxygen tank, and a porcupine-inspired self-discharging laser beam. The Maseno School Senior Principal also has their room inside the bus - fitted with an adjustable luxury rest chair imported from IKEA Sweden, a digital tactical board for going through team tactics especially in match venues that have no proper locker rooms for the visiting team. 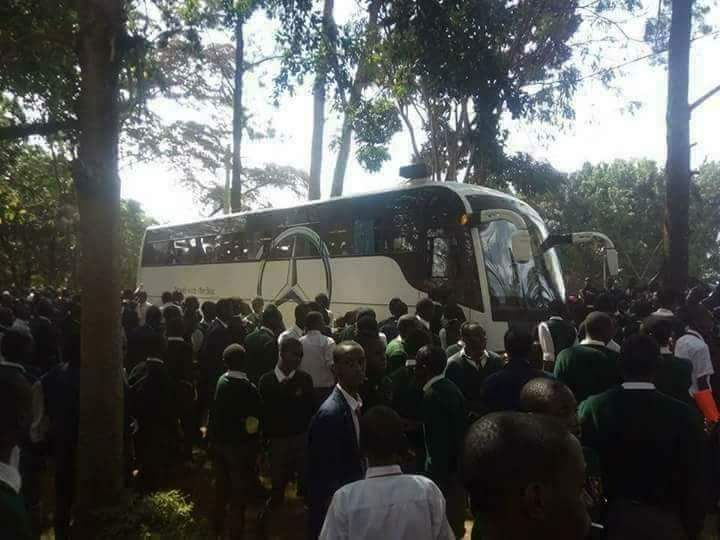 The Principal's compartment also acts as the control tower of the live satelitte feed from the match venues, where the Maseno School technical director can go over their opponents tactics in real time and relay the Intel down the touchline for changes. The pick of the bunch is the Active Break Assist feature on the Maseno School German Beast, a first of its own in the world. With the help of the radar detection system installed on the surface of the German Whale, the bus has the innate ability of communicating with road signs around it regulating the speed, braking for stationary objects crossing the road, and alerting the driver on potential dangers the bus is exposed to way before the bus gets to such hotspots. The Daimler group, with the approval of NASA, the space agency, have installed the latest route-mapping technology in the Travego that helps with mapping up alternative routes in instances where the Travego finds itself stalled in traffic jams, especially when its in the big cities of Africa. The tyre safety feature is the best in the world. With the help of the radar detection system, the Travego self-regulates its tyre pressure based on outside surrounding. To prevent tyre damage, the Maseno School German Machine comes with a pothole detection system that launches a special spring on the treads to give the bus a soft landing when navigating giant crater holes on our badly patched roads. And in the unlikely event that a hooligan plants an explosive device on its path and blows the tyres of the Beast, the Maseno School German Machine can run on its bare steel rims for more than 100 kilometres on its way to safety. Post Courtesy Of George Odunga, Facebook. Advanced technology in application in rural school in Kenya. Very informative. Haha nice article but despite Maseno being my alma mater, I find some if not all the features here exaggerated..